Closely coiled helical spring is loaded by a compression force. The spring has a middle diameter D, the wire diameter d, and it consists of i turns. 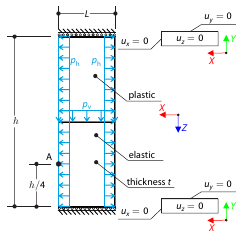 The total length of the spring is L. Determine the total deflection of the spring for the member model and one‑turn deflection for the solid model. Determine the y-position of the center of gravity for the given bodies, namely semicircle, half-disc, hemispherical shell and half-ball. A rectangular steel plate of dimensions is simply supported at its edges. 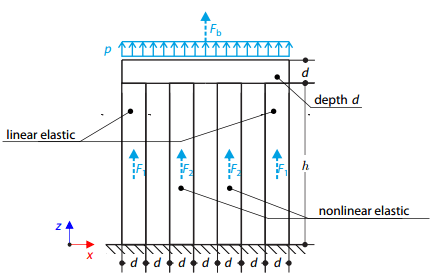 Determine the natural frequencies of the rectangular plate. 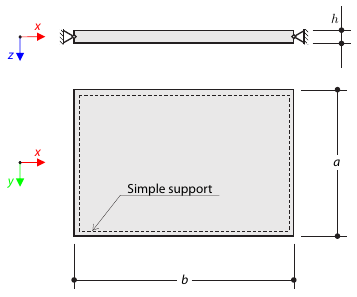 A cantilever with circular cross‑section is loaded by a concentrated bending force and torque. 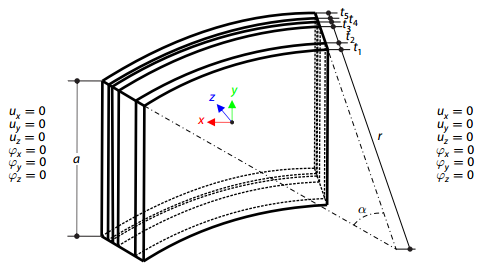 The aim of this verification example is to compare the reduced stress according to the von Mises and Tresca theories.